Known for its low-priced yet quality products, Xiaomi undercuts its rivals again as it unveiled its first drone on Thursday, May 26. 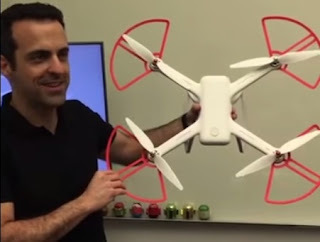 Estimates from industry observers were in the area of $600+ for the Xiaomi drone. But the Chinese smartphone company surprised everyone, including its competitors. Xiaomi revealed that the Mi Drone will only cost $380 (2499 CNY) for the entry level variant which has a 1080P camera, and $450 (2999) for the higher end model. The $450 advanced model with a 4K camera is amost half the price of market leader DJI whose comparable drone, Phantom 3 with 4K UHD video camera, is priced at $799 on its website. 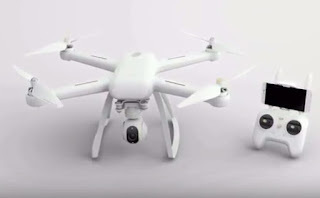 Although Xiaomi has no definite release date for the product, the launching of its drone has created a buzz on Facebook, with roughly 195,000 viewers tuning in to its live stream. Hugo Barra, the VP of International for Xiaomi made a Live Unboxing for the Mi Drone on Xiaomi Live and Facebook Live. He described its design as beautiful and simplistic, which some people say is a "four-legged spider". Overall design of the drone is modular, with a foldable landing gear. Unassembled, the drone can be carried in a regular backpack. The Mi Drone is light and compact. Two-thirds of its weight is that of the battery, says Barra. It is equipped with a powerful 5100 mAh, 17.4 battery that allows it to achieve a maximum 27 minutes of non-stop flying. The controller has a PCB antenna technology which gives it the best possible reach, "up to 2 kilometers livestreaming of video in 720p". It also gives one an option to attach a smartphone for a live-feed from the drone. The Mi Drone has an ultra-light gimbal 4K Ultra HD camera. The 12.4 megapixels camera is similar to those of flagship smartphones. It has a wide angle, (104 degrees) to capture as much view as possible, without making it distorted or fish-eye like, according to Barra. If you're worried about getting back your drone while it's on air, fret not. The drone's controller has a "go home" mode, which commands the device to come back to where it took off. It will also return home or closer to the remote automatically if it has gone too far or if its battery is in critical level. The drone knows how much battery it needs to go back "home", Barra explained. The location tracker works even if it the user crashes it "for whatever reason", Barra added. With its auto-pilot option, you can choose a point on a map and ask the drone to drive there. You can plan its route, so it can fly from one point to another. Of course you have to consider its range when choosing where it should go. The Mi Drone also has another auto-pilot function wherein you can set it to circle around a particular point or object. You have to set the point where you want it to circle around, the altitude, and the diameter of the circle. The device can also be used indoors, which is pretty good news for those who want to take a top shot of their indoor activities. Sounds like a pretty amazing gadget not only for photography enthusiasts but for people who like cool gadgets. But if you think only very few people will actually buy a drone, think again. Drone sales are expected to increase to 16 million by 2020 and the consumer market can reach a staggering $4.19 billion by 2024, according to the Grand View Research cited by Bloomberg. With the smartphone market almost reaching its saturation point, the drone could just be the next big thing.